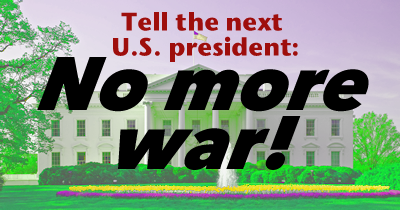 ORGANIZATION ENDORSEMENT PAGE: Tell the next president: No more war! ORGANIZATION ENDORSEMENT PAGE: Tell the next president: No more war! ORGANIZATION ENDORSEMENT PAGE: Tell the next president: No more war! USE THIS PAGE ONLY TO ENDORSE AS AN ORGANIZATION. To sign as an individual please click here instead. We call on you to end perpetual war by the United States Government. As signers of this petition, we commit ourselves to building nonviolent pressure to end continual U.S. warfare. We also reject our country's bloated military spending and massive arms sales that make the USA the world’s leading arms trafficker by a huge margin. By taking action you agree that you may receive action alerts from RootsAction. We consider your contact information to be private and confidential. We will NOT disclose it to any other entity unless you specifically authorize us to do so. You can unsubscribe at the bottom of any email you receive from us.